Waxing lyrical. Any substance behind it? What actually happened that was particularly special that wasn't already planned? "The rainbow at the tail of the storm of the difficult years of this decade" indeed. I suspect that we're not even half way through it. Wonder what the theme of Budget 2019 will be? 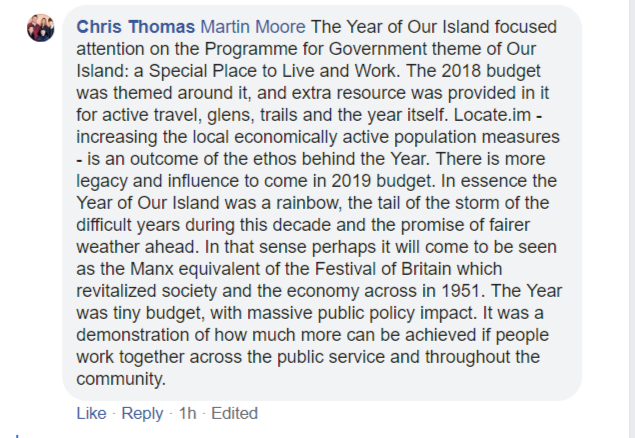 "Young mums must earn their way, ordinary folks must do at least two jobs to survive, state pensioners will be paid at subsistence levels, privatise the Manx NHS, etc, etc"
A rainbow at the tail of the storm. It says it all when Mr Thomas gets all wordy! Could have made it clearer what it was all about from the beginning instead of in retrospect. I was asking about it when it first came out and nobody provided any substantive answers or addressed my concerns. Was there any consultation prior to Tynpotwald being manipulated into voting for the Year of the Island 2018? Or was mine and many other taxpayers money merely allocated for this frivolous exercise. I would like to see what was hoped to be achieved as compared to what was actually acheived? Was tourist statistics increased as a result of special activities? I would argue that as Locate.im was used to sponsor both the TT and the FOM, this isn’t brilliant as we haven’t enough sponsors for the races, and are relying on IOMGs pet projects to cover up. What a load of s...e this man comes up with, he has fingers in more political pies than Jack Horner and what he has achieved in his terms of office could be written on the back of a postage stamp. How people can take him or his actions seriously I will never understand to call him a buffoon insults buffoons. He is good at one thing, spending and wasting taxpayers money, money that decent , hardworking people have had to graft for I hope the people who voted for him at the last election are pleased with themselves for landing us with such a man who is obviously so up himself he cannot see why the Island does not need this expensive tripe.